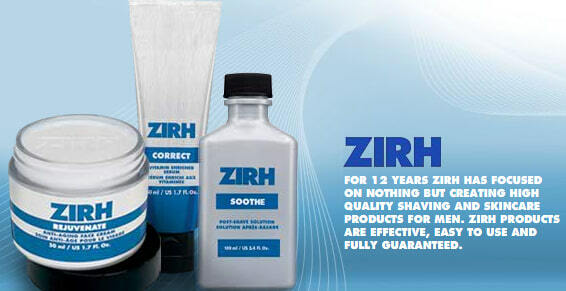 ZIRH has provided men across the globe with grooming and care products since 1995. They are the ideal tools to prepare skin for life's daily challenges. It is their mission to supply guys with a grooming regimen that has zero confusion and complete ease of use. From the functional names to the straightforward benefits, ZIRH offers step-by-step systems that deliver results with simplicity, strength and total protection. Our focus is on quality and convenience. Many companies simply re-packge their women's products and call the result a "men's line". We find this unethical. ZIRH was created over fifteen years ago to create products - from the ground up - formulated to work for men. Perhaps that's why so many studio make-up artists, professional athletes and successful men the world over look only to us.